If your child is ill, the Child Health Service is here to make the journey through the health system as easy as possible both on the child and their parent/ guardian and provide the most comfortable, caring environment possible. We have services based on two campuses: Christchurch Hospital Campus and Burwood Hospital Campus. You can can also find out more about our Child Health Advisory Council. The Public Health Nursing Service offers support to children, young people and their families across all schools in Canterbury with nurses based at some rural facilities. If your baby has a hearing loss, finding it early will help their language, learning and social development. The Newborn Hearing Screening Information for Parents aims to identify newborns with hearing loss early so they can access appropriate assistance as soon as possible. 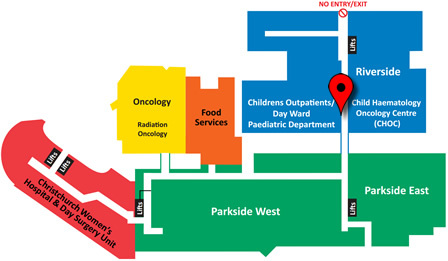 ​​​​​​​​Where is the Children’s Outpatients Department? Exit lift, turn left and the outpatients’ dept is down the corridor on the right. ​Note: The entrance to the Riverside Building is currently closed due to construction. Car parking is limited so please leave an extra 20 minutes to find a park. There is currently NO CAR PARKING at Christchurch Hospital, except for a limited number of disability car parks. Please refer to www.cdhb.health.nz/parking for more information. There are a number of buses that travel to and from Christchurch Hospital. See our Christchurch Hospital page for a list of bus routes to Christchurch Hospital or visit www.metroinfo.org.nz or call 366 8855 for information on bus timetables and route maps. Families travelling long distances to Christchurch, may be eligible for accommodation assistance. If living out 100km or more from the city, Ronald McDonald House is available. Arrangements should be made by your referring health professional or a social worker. If you can answer yes to one or more of the following questions and have been referred by a health specialist, you may be eligible to claim. Do you travel more than 80 km one way, per visit? Do you visit a specialist 2 or more times in two months? Do you visit a specialist 6 or more times in 6 months, and travel more than 25 km one way, per visit? Are you a Community Services Card holder and travel more than 25 km one way, per visit? For more information about travel assistance call 03 378 6398. Can be organised at no charge to you, but must be arranged in advance. Ask the hospital staff to arrange this through Customer Services, Christchurch Hospital, phone 03 364 0843. Māori Health Workers and Chaplains​ can be available to support you, but should be arranged before your appointment. Children’s Outpatients offer specialist appointments Monday to Friday, from 8:30am to 4:30pm. Each consultant team has set days to conduct their appointments. Your child may be seen by a registrar, however your named consultant will still be responsible for your child’s care. If you wish to change or cancel your appointment, please do so as soon as possible. If you wish to change your appointment you will be offered an alternative date and time. This may extend the time your child waits to see the specialist team. Missed appointments make our waiting lists longer and prevent other children from being seen. Arrive 10 minutes early in case you need to see the nurse first. You can bring a support person. Make sure you have enough prescriptions to last you until your next visit. Organise child care for your other children. Bring your well child book if your child is under 5 years. Put your suggestion in the blue box in the department. Phone Advocacy Services on 377 7501. Write to Safety & Quality Team Leader, Women’s & Children’s Health, Corporate Building, 4th Floor, 32 Oxford Terrace, or phone on 364 4556. Write to Charge Nurse Manager, Children’s Outpatients Department, Lower Ground Floor, Riverside, Christchurch Hospital, or phone on 378 6144. Child Haematology & Oncology (CHOC) is one of two specialist treatment centres for childhood cancer, the other being Starship Hospital. We care for infants, children and adolescents with cancer, and their families/whanau. You can view more information about Child Haematology & Oncology (CHOC) in our health services directory. The Canterbury Neonatal Service provides a holistic family/whānau​ oriented model of care. We view the baby/pēpi as being the focus for our planning of care and for this reason, we have incorporated a “Developmentally Supportive Care” philosophy for all our babies/pēpi​. The Neonatal Service provides 24-hour care for newborn babies with a variety of special needs. This includes prematurity, surgery, congenital abnormalities and babies who may have been compromised at birth. Care is provided by a skilled and experienced multi-disciplinary team utilising current evidence based practice. Parents are welcome 24 hours per day. For privacy reasons you will be asked to wear headphones provided during the medical ward round and nursing handovers. You will be asked to please respect the privacy of other families: do not look or ask about other babies. All visitors are to be accompanied by a parent. Visitors are welcome between 11.00am to 1.00pm, and again between 3.00pm to 8.00pm. Brothers and sisters of all ages are welcome under adult supervision and are included in the 3 per family policy. Other children under 12 years of age are not permitted to visit due to the increased risk of infections in this age group. No visitors will be permitted between 1.00pm to 3.00pm. This enables parents to spend uninterrupted quiet time with their baby. Referral to these services is arrang​ed by hospital staff. To raise with the health organisations and promote organisational change on issues which hinder appropriate care. The service can be contacted by phoning 03 377 7501 (leave a message on the answer phone if the office is unattended). If you wish to notify the interpreting service of your impending admission to hospital please email the service at interpreterbookings@cdhb.health.nz or phone 03 364 0669. La Leche League have found the kind of information and support they need to breastfeed their babies. The Ministry of Health also has valuable advice for new mothers on its website. Dunsandel School Student Council organised a mufti day to raise money to purchase some cool toys for the Activity Room toy library. Staying in hospital can be a stressful time for children and their families. We do everything possible to provide a comfortable environment for you and your child. If your child is scheduled to stay in the hospital you will receive an admission letter from the hospital outlining where you are to go and what time. Please take special note whether your child is allowed to eat or drink prior to arrival. This is what you’ll need to bring with you and what amenities are available for your convenience. 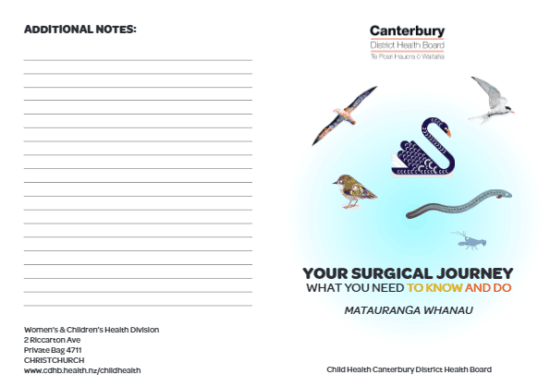 Your Surgical Journey (PDF, 1MB) What you need to know and do. A parent/caregiver is encouraged to stay overnight, you may be provided ​​with a bed or a pull-out chair, and you may share a room or have your own. If arranged admission, go directly to the department/ward which is specified on your admission letter. Accommodation for out of town families is available, this needs to be arra​​nged prior to admitting at Christchurch Hospital, please ask your Social Worker at your local hospital to arrange this. Bring pyjamas​​, comfortable clothing, a favourite toy, game or book (toys, books, games, TV and DVDs are provided by the hospital). All food for your child is provided. Please notify staff if your child has special dietary needs. If your baby is on a breast milk substitute please bring this with you (the wards only s​​tock one type). If your baby needs to have a breast milk substitute during your time on the ward, your written consent will be required before it can be given. Breakfast and tea/coffee/water are provided free for parents. A​​dditional food and drinks can be purchased from the Christchur​​ch Hospital facilities or vending machines. Meals are provided on the ward for a mother breastfeeding a patient less than 6 months of age. Hospital meals can be ordered and provided for $5 if you are unable to leave your child. Payment is made to the Ward Clerk. Change for vending machines etc can be provided at the BNZ located in the Main Foyer, Ground Floor, Christchurch Hospital. Showers are available​. Remember to wash your hands often to avoid spreading germs to your child or other patients. Ward 21 has a​​​ washing machine and dryer for parents in the children’s wards. Bring valuables at your own risk. ​Internet access is free and accessbile from – DHB Public Wi-Fi. There is a Westp​ac ATM machine located in the main foyer, Christchurch Hospital and a BNZ ATM machine located on the ground floor, Christchurch Women’s Hospital. Notes can be exchanged for coins at the Bank of New Zealand, M​ain Foyer, Christchurch Hospita​​​l. Smoking is not permitted within any CDHB hospital or on hospital g​​rounds. Quitpacks can be arranged. Please speak to a staff member if you wish to find out further information. From time to time patients, outside organisations and individuals offer donations or bequests to the benefit of our patients within Child Health services. Child Health is always grateful for any financial assistance received by way of these donations and bequests as it enables us to purchase additional items of equipment, especially for the benefit of patients. Just like home, there are potential hazards in the hospital environment that we all need to be aware of. It is important that while a child is in hospital that those caring for them, including parents/ caregivers are aware of these hazards. So check this out for yourself by watching our newest video ‘Keeping your child safe in hospital’. Coming into hospital can be little bit scary. To help make you less anxious Charlie, Sheena and Gemma from What Now have made some videos to show you what may happen during your stay. A parent/caregiver is encouraged to stay with their child overnight. If you have a health concern please contact either your GP or after hours surgery in the first instance. All other enquiries please contact the main hospital switchboard at Christchurch Hospital on (03) 364 0640, or directly on the Canterbury DHB website. The Christchurch Hospital Campus is in the process of many redevelopments, one of which will include a new facility for children. To keep up to date with the progress of the redevelopment, visit the It’s All Happening website.